Mike Billinghurst with an introduction to fencing your lifestyle property. 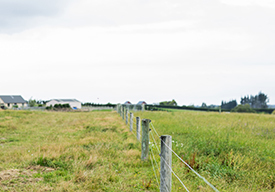 An essential component to any small block, fencing offers security and boundary definition along with allowing you to control grass growth, choosing when stock can go on and off paddocks, gardens or lawns. Whether you’re planning to fence a new property or considering fencing a parcel of land to accommodate new stock, here’s some key things to consider. There are many types of fencing with decisions on what to build usually relating to the stock being run. For example, if fencing for horses consider a higher fence than required for say sheep. As well, horses chew rail fences, so an electric wire on the rail can protect against this. Fencing options include post and rail, post and batten wire fencing, netting wire fencing, a combination of styles with rails and wire or possibly electric fencing, having less wires with the stock contained by a shock. Think about the contour of your land when planning fencing as well as the flow of stock around the property. A central race is a great idea as it allows for stock to be shifted with minimal disruption to other animals on the farm. Make sure any areas that could create a stock trap, or a sharp corner where animals could damage hemselves, is fenced off. Fence off waterways and wet areas. Wet areas can be planted or consider a water feature or dam. For stock protection fence along ridges and avoid creek crossings where possible. Decide on the size of your house section as well as sheds and stock yards. Consider how to best access these areas from other parts of the property. Wondering if you should give fencing a go yourself or get a contractor? Mike suggests seeking a professional to help with fencing as the same principle applies as building a house - the most important work to ensure a sound structure is completed underground. After that any maintenance, if you have some knowledge of fencing, can be completed by yourself. Mike Billinghurst has been a professional fencing contractor for the last 14 years and is a recent past president of the Fencing Contractors Association NZ. Find your local accredited contractor at www.fcanz.co.nz/find-a-fencing-contractor.